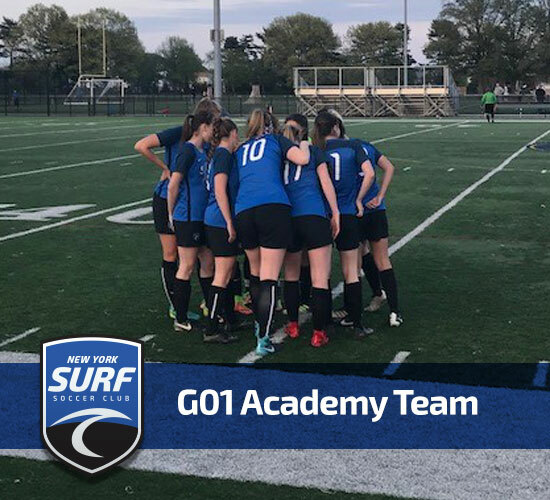 The NY Surf G01 Academy team earned a 3-1 win against their NY Surf G01 Long Island counterpart and advance to the NY State Cup Finals in June. The team is led by Stony Brook University Head Coach Brendan Faherty and currently sits atop the Eastern Regional League division standings with a 7-0 record this spring. The G01 Academy 2019 college commitments include: University of Vermont, Stony Brook University, U.S. Naval Academy, College of Saint Rose, Adelphi University, Bloomsburg University, SUNY Cortland, and Farmingdale State College. For Girls 2001 tryout information click here.